Two-time national sled hockey champion. Winter X Games silver medalist, twice. A couple of kids. Two tours of duty in Iraq with the Army 2nd Infantry Division. Double amputee. For Sgt. Brandon Adam, the important things in his life have come in pairs. All of them have fueled his competitive spirit, some have changed his outlook. The last one in particular — he refuses to let it slow him down. 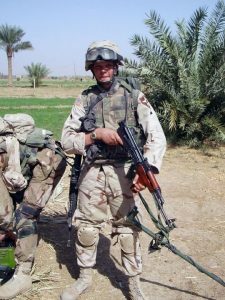 Adam, 32, of Woodland Park, Colo., got hit by an improvised explosive device in 2007. Doctors amputated both his legs above the knee, and he spent almost a year and a half after the incident at Fort Sam Houston in San Antonio recovering. After his retirement, he returned home and has since immersed himself in sports as a means of rehabilitation. He played golf regularly before his injury, and continued to do so after his release from Fort Sam Houston, but the loss of his legs required serious adjustments in his game. Most importantly, he had to find a way to swing without the ability to shift his weight or rotate his lower body. His first two summers back on the course were more frustrating than fun. He’s spent hours post-injury working on his game with Paul Surniak, one of the instructors at the SMGA’s Fort Carson chapter in Colorado. Surniak has helped Adam’s transition into a swing that works for him, though Adam jokingly admits he breaks almost every rule foundational to a golf swing. Since his amputations are well above the knees, Adam uses a Solorider, a single rider golf cart designed for adaptive players. The cart allows him to strap his waist down, stand, and swing. He considers his move a flatter, baseball style-type swing, necessitated by his use of the Solorider. Playing in the cart makes the game accessible and enjoyable for Adam, especially when his oldest daughter joins him on the course. Though he has taken lessons from Surniak for years, he had never participated in a Warrior Golf Clinic until this summer. 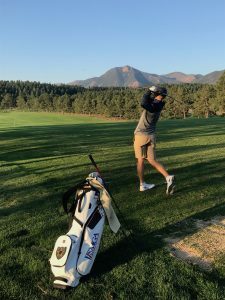 The golf season is relatively short in Woodland Park, so Adam has ways to feed his competitive side in every season. Living in Colorado lends itself to faster-paced winter sports, and in his first year home from Fort Sam Houston he picked up monoskiing. Learning to ski offered freedom from the wheelchair and a heavy dose of adrenaline. It also allowed him to race. And he’s really, really good at it. He took home silver medals for Mono Skier X at the X Games in both 2011 and 2015. The organizers didn’t hold the race this past winter, but Adam says he’s still “chasing that gold,” hoping the race runs again in the future. For now, he will focus on sled hockey, an adaptive form of ice hockey that uses sleds with skate blades and hockey sticks that double as ski poles. He started playing in 2015 and picked up the game quickly, joining the Colorado Sled Hockey program, who had won the prior season’s national championship, and earning a spot on their “A” team. They have been champions the past two years as well. Nearly a decade has passed since Adam’s retirement from the military, but he embodies his division’s motto now more than ever. The George Washington Men’s Golf Team, who often volunteer at the Warrior clinics at Olney Golf Park in Maryland, played at Air Force Academy’s Gene Miranda Falcon Invite this past weekend outside Colorado Springs, honoring Adam by attaching his symbols to their Warrior Tribute bag. He sent the team two items: his Second Infantry Division Indianhead patch, previously worn on his Army Service Uniform, and an Engineer Castle pin, to represent his work as an Army Engineer. 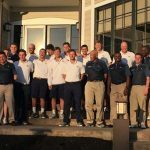 GW redshirt senior Christian Cichan had the privilege of using the bag for its inaugural event, and turned in a great result for his team to set a precedent. He charged up the leaderboard with a final round four-under par 68 to finish tied for 29th in a strong field. Before the tournament, he found inspiration in the man he would be recognizing. Of course, the only truly appropriate way to honor Adam, knowing his competitive streak and knack for finding the podium, is to win. Still, Cichan gave his all on the course this weekend for the sergeant he paid tribute to. That’s second to none.